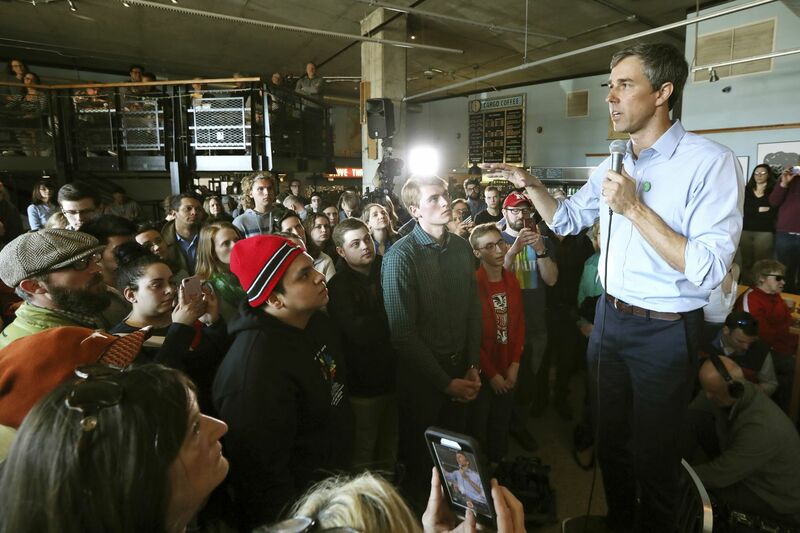 Beto O’Rourke to visit State College Tuesday as Democratic primary reaches Pa.
Democratic presidential candidate Beto O'Rourke visits Cargo Coffee on East Washington Avenue during a stop in Madison, Wis on, Sunday. He is planning to visit State College, Pa. on Tuesday. WASHINGTON — Beto O’Rourke will visit State College Tuesday morning for what is believed to be the first public event in Pennsylvania held by any of the Democratic candidates for president. O’Rourke, the former Texas congressman who stirred grassroots excitement with a tough challenge to Republican Sen. Ted Cruz last fall, will hold a meet-and-greet at 10 a.m. in the Hetzel Union Building of Pennsylvania State University. In visiting central Pennsylvania, O’Rourke, 46, is eschewing the biggest Democratic hubs in the state, Philadelphia and Pittsburgh, but will stop at a college campus where his youthful appeal may resonate. The event will be part of an early tour through swing states that will include stops in Ohio, Michigan, and Wisconsin. Several Democratic contenders, including Sens. Cory Booker and Amy Klobuchar, and current or former governors, such as Colorado’s John Hickenlooper and Montana’s Steve Bullock, have held Pennsylvania fund-raisers and private meet-and-greet events, or have reached out to party insiders, though none is known to have held a public campaign event. The state’s voters seem unlikely to have much direct say on the Democratic nomination, since its primary doesn’t arrive until late April 2020, but a candidate’s ability to win swing states such as Pennsylvania could be a major issue when it comes to arguments over electability. In the general election, Pennsylvania is expected to be one of the four or five most competitive and decisive states. President Donald Trump has repeatedly visited Pennsylvania, both as a candidate and as president, signaling the importance he places on the state.